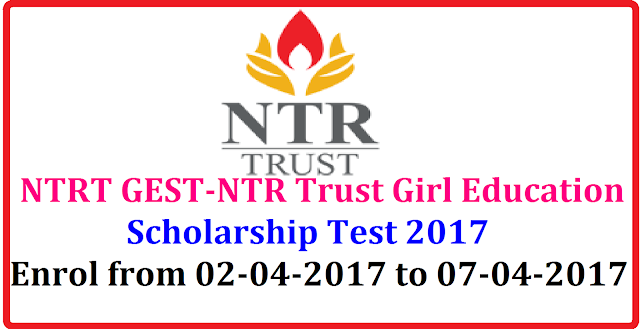 NTR Trust is committed to give quality education and financial assistance for meritorious girl Students. To identify the beneficiaries,NTR Trust is conducting GEST 2017. Total 25 Students will get a merit Scholarship to persue their Intermediate in NTR Junior Gollege, Hyderabad for two years in English Medium.Out of 25 selected students ,first 10 students can get a monthly scholarship of Rs 5000/- and other 15 studets can get a monthly scholarship of Rs 3,000/-. Test Pattern: Objective Type Multiple Choice Questions,Max Marks 100, Duration-2 hours, Paper will be in English.